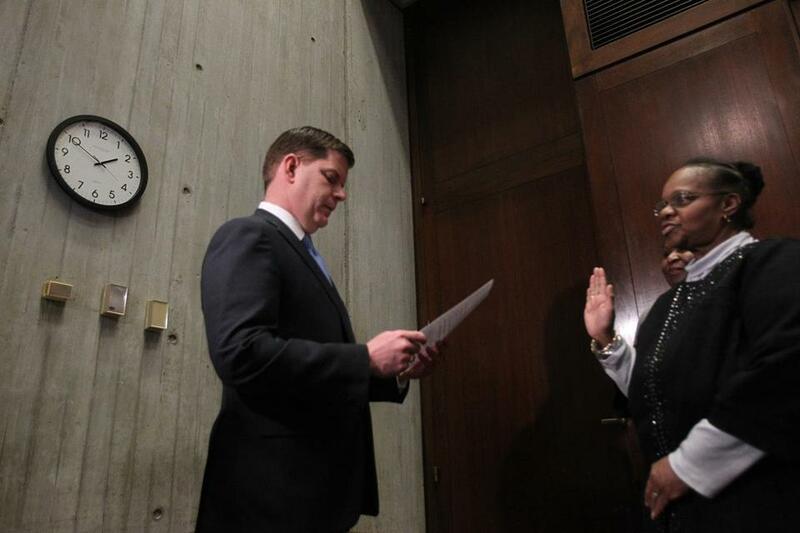 Boston Mayor Martin J. Walsh swore in Jeri Robinson to the school committee in 2014. 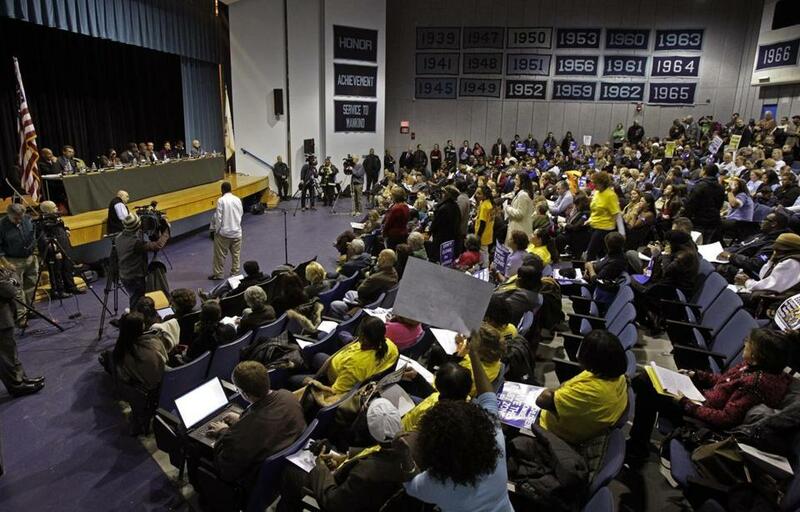 These days, Boston School Committee meetings run so long they are sometimes plunged into near darkness when overhead lights automatically shut off at 11 p.m., a clear sign that it might be time to call it quits after five hours of talking. Yet the talking can continue. “It’s quite amazing to have complex policy discussions happening in the dark,” said Heshan Berents-Weeramuni, cochairman of the Citywide Parent Council. Once run under a tight time clock, the meetings now ramble on for four, five, or even six hours. It is a dramatic shift for a board that for years had been criticized for speaking very little and rubber-stamping superintendents’ recommendations. The board’s leadership now encourages more discussion among members in the spirit of greater transparency. Other factors drawing out the twice-a-month meetings: Superintendent Tommy Chang delivers longer reports than his predecessors, and more parents testify as the board takes up one lightning rod issue after another — budget cuts, lead in the water, school closures, and charter school expansion, to name a few. The meetings, which begin at 6 p.m., run so late some nights that a family vacationing in Aruba could take a flight home when the meeting starts and still make it in time for the final round of public testimony at the end. Committee chairman Michael O’Neill said the long meetings are a worthwhile trade-off for giving issues careful consideration instead of rushing through an agenda. The seven-member board is appointed by Mayor Martin J. Walsh. In one way, Boston’s situation is unique in Massachusetts. It is the only school system in the state, and among a few nationwide, with an appointed — rather than elected — School Committee. Boston made the switch in 1992 amid criticism that its elected board had become dysfunctional and even a comic sideshow as many members used it as a steppingstone to higher office. The elected School Committee meetings were known to run late. But many parents, students, teachers, and community activists have argued that the loss of elected representation has made the board less democratic and less accountable to the public, and for a long time the proceedings often appeared to be shrouded in secrecy. It was not possible to compare the length of meetings in the previous decade because the School Committee did not record minutes of the proceedings at that time. But the board’s past reputation for brevity was infamous. A Globe reporter timed each member at a September 2005 meeting and found that the chairwoman, Elizabeth Reilinger, spoke the longest at just seven minutes and 13 seconds. The Boston School Committee held a meeting at Boston English High School in 2015. By last year, the average length of a School Committee meeting was four hours, according to a Globe review, which did not include executive sessions. The longest meeting, on March 16, began as a public hearing on a proposed school budget, and it lasted six hours and 52 minutes as a long line of parents, students, teachers, and community activists testified. While some other school committees set firm limits on meeting times, Boston has only one rule to manage time. Each member of the public is limited to three minutes to speak; that time gets reduced to two minutes if 20 or more people sign up to testify. The rule frustrates many speakers, who often point out that School Committee members face no such limits. Yet in spite of all the talk, the School Committee has not broken one habit: voting unanimously nearly all the time. Of the 59 action items approved in 2016, members voted unanimously 57 times, according to a Globe review. Action items are the most substantive votes the committee makes and include approving grants, policy changes, the school budget, and school closures. O’Neill defended the committee’s voting record, saying that the superintendent — based on concerns raised by the board and the public — has revised recommendations to make them more palatable. The School Committee meetings began to lengthen a bit under a former chairman, the Rev. Gregory Groover, who urged members to speak up and show democracy in action. It came as calls from the public intensified for a return to an elected body after a polarizing vote in December 2010 to close or merge about 18 schools. Many gadflies thought when O’Neill took over as chairman four years ago that the business executive would move for shorter meetings, but he has encouraged members to speak even more. Sometimes members themselves grow tired as a meeting drags on. Last year on Jan. 27, as the clock ticked toward 11 p.m., Miren Uriarte pushed back when O’Neill insisted on proceeding with the rest of the agenda. “It’s going to be very hard right now to do justice to these presentations,” she said. Megan Wolf, who regularly attends the meetings as a member of the grass-roots parent organization Quality Education for Every Student, said she values the lengthy public discussions but sometimes questions the usefulness of the information conveyed. “If there is real info given in the purpose of transparency, that is good,” she said.